I went with alliteration today. I was feeling it. I made this salmon dish for dinner on Monday night. I assumed I’d shared the recipe long ago because it’s been a staple in my house for a while, but no. I never let you guys in on this tasty (and easy) dish. I will now. I’ve adapted this recipe to my own tastes from this dish. I start by cooking the rice, whether I’m using spinach or broccoli. For spinach, I cook the rice on the stove and for broccoli, I use my rice cooker. You could probably use the rice cooker for the spinach, but I like the way the rice tastes more if the spinach is wilted in the rice itself. In any case, start your rice. Prepare the filets by sprinkling a little bit of pepper over each. Broil for about 4 minutes. In the mean time, prepping the salmon sauce takes less than a minute. Simply combine the soy sauce, pepper jelly, and ginger. That’s all. Take the salmon out of the stove, pour the sauce over each filet, and return the fish to broil another 4 minutes or so. Check often to make sure it doesn’t burn. It happens quickly. Watch out. If you’re using broccoli, steam the broccoli until it’s still a crispy consistency, but cooked. Add the broccoli to a plate over rice and top with the salmon. 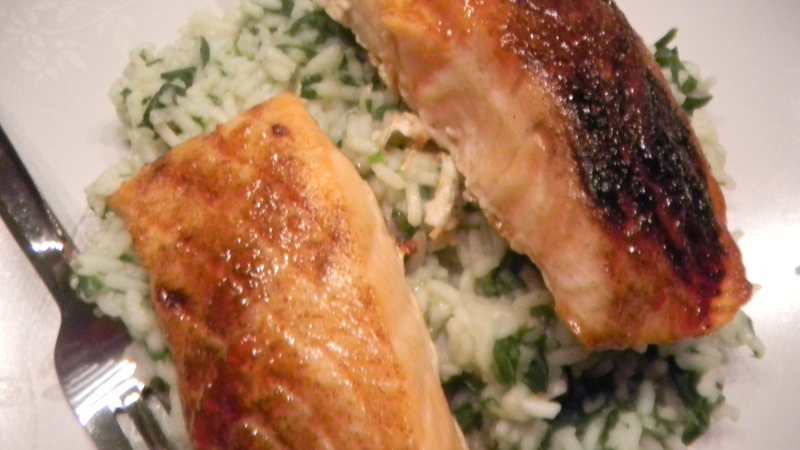 If you’re using spinach, add it to the rice when it still has a few minutes left to cook. You can add salt or pepper if you want. 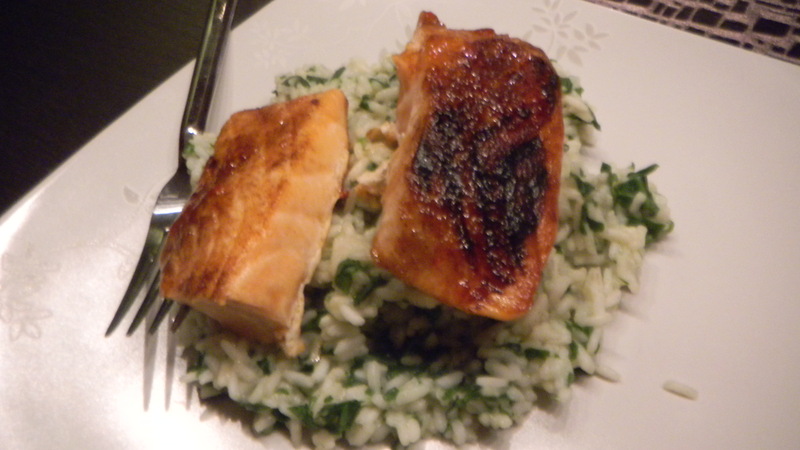 Serve the salmon directly atop the rice. This is one of those recipe I pull out whenever I’m not sure what to make. We always have salmon around, and it just depends on whether I have spinach or broccoli around in deciding which to make. The total time for this meal is just how long it takes the rice to cook. One final note on the pepper jelly, I’ve noticed that the consistency of my sauce depends on the type of jelly I have. 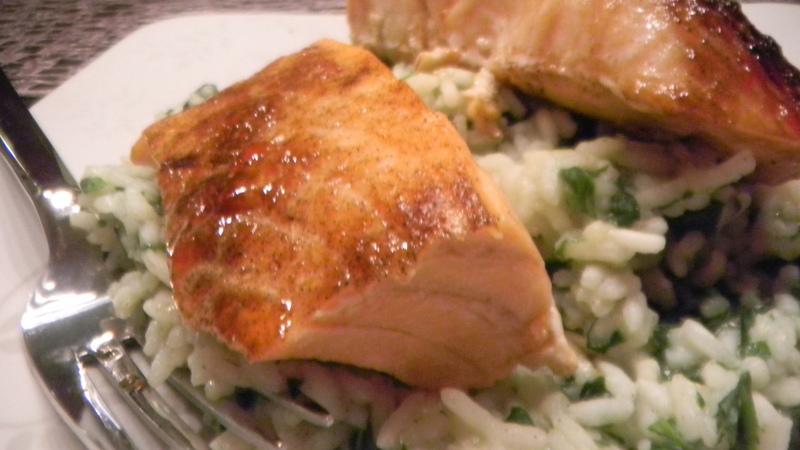 The store bought pepper jelly makes for a thicker sauce that stays put on the salmon. Farmer’s Market jelly lacks many preservatives and is fresher, so the sauce is more liquidy and will more easily slide off of the salmon. Both kinds of jelly work, I jsut wanted to give you a heads up on what will happen if you change the kind of jelly you’re using. It takes a lot for me to willingly eat fish, so I think it speaks very highly of this recipe that it’s one of my go-to dishes. Try it for a healthy meal.